I asked our Video Marketing Specialist, Mark, to take a stab at outlining his ideas on video marketing strategy – and I was surprised with the outcome. We've been blogging and vlogging quite a bit about video marketing lately. And for good reason. Video is changing how we reach new prospects, convert traffic into leads on our websites, close sales, cover customer service issues, and delight our brand advocates. 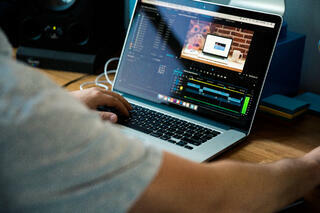 Basically, video is shaping our modern inbound marketing strategy. According to the 2017 State of Inbound Report, released by HubSpot this morning, video is the "main disruptor" cited by survey respondents. As stated in the report, "many see video as the a great channel to better connect with a prospect, while others fret that video will make their day jobs obsolete." One reason content marketers who specialize in writing and editing worry about the impact video will have on their careers revolves around the fear of the unknown or resistance to learning new skills. On the flip side, others are choosing to get trained in writing for video production. One respondent argued that the move to video is a "natural evolution, and only those resistant to the change will see it as a disruption." Regardless of how you feel video will impact your career, the medium is here to stay. If you want to be ahead of the game, start working on your video marketing strategy and how it plays into your overall inbound approach. So, what does a modern video marketing strategy really look like? Rather than detailing what needs to be accomplished pre-, during, and post-production, he sent me some higher-level thoughts. If that sounds like an inbound strategy, he continued, that's the point. In our B2B world, video should be aligned with your overall strategy and business goals. If you don't have any goals or a strategy for sales and marketing, video is just another shiny tactic. And an expensive one at that. However, the same strategies you apply to your content and inbound efforts can be applied to video marketing in new and exciting ways, and responses from the 2017 State of Inbound report mirror this premise. Video has the power to bring people to the forefront by featuring real people and sharing their stories. This provides for a human connection that can be lacking in traditional online copy. "Video is just going to get bigger and bigger," said one survey respondent. "I think more people want raw, honest connection. They want to know you and the company in a way that feels personal." Video is the most sought after way of learning because people want to consume information visually. For this reason, businesses are embracing video as a means to educate prospects and customers throughout the buyer's journey. "We're responding to people's desire to learn online through video as opposed to face to face," said another survey respondent. Video content can also be shaped in various ways depending on the audience (dust off those buyer personas) and channel. A trained eye knows how to create purposeful, strategic videos depending on where they will be consumed (social media, home page, landing page, etc.). Another survey taker noted, "We're moving towards more live videos and video content on social media and adapting our approach to be less 'in-your-face' and more subtle to acquire conversions." The survey also notes that a one-size-fits-all approach is dangerous to reach for. That's probably why Mark didn't drop a list of "how-to's" on my desk when I asked him to outline a modern video marketing strategy. As with any piece of content, he agreed, you need to be conscious of your audience, channel, format, topic, and most importantly, how it fits into your overall business goals.